A universal humanitarian and visionary, Shuddhaanandaa Brahmachari (Baba) translates eternal teachings and principles into actions that embody the feeling heart. As an economist-turned-monk, his vision combines both aspects of his background. Through his Lokenath Divine Life Mission (LDLM) programs of sustainable development in India, Baba reminds us that we can work together, now and always, for the openness and universality that will regenerate humanity to create a world free of economic disparities and social injustice, a world united by the thread of love, compassion and spiritual Oneness. Around the globe, Baba awakens and stimulates the feeling heart in those lives he touches as he describes his simple, yet profound philosophy of self help. LDLM Programs are designed so that those served will discover the magnitude of their own strength, character and capacity to make a difference, not only in their own lives, but in the lives of others and that of their community. Baba does not believe in traditional charity. He prefers to support people in liberating themselves rather than do anything to reinforce their sense of powerlessness. His Lokenath Divine Life Mission in India has served millions of people since its inception in 1985. Baba invites you to be an integral part of a community that actively seeks to participate and experience the missions work in India. That we can work together, now and always, for the openness and universality that will regenerate humanity to create a world free of economic disparities and social injustice, a world united by the thread of love, compassion and spiritual Oneness. Born on May 10, 1949, Baba received a Masters in Commerce in 1972 at Andhra University, Vishakapatnam, India. From 1972–76 he taught Commerce at Andhra Vidyalaya College, in Hyderabad, India, leaving his economic professor career to dedicate his life to God and alleviation of human suffering. 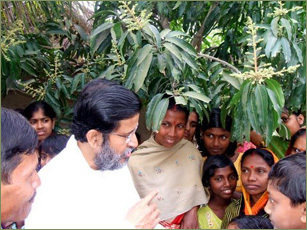 In 1985 he founded Lokenath Divine Life Mission, which has served millions of people in India. In 2005 Baba founded Stress Management Academy, and began conducting seminars on breathing, relaxation, meditation and positive thinking globally for schools, corporations, hospitals, prisons and other venues. For more information about Baba’s Course in Mindfulness www.courseinmindfulness.com.